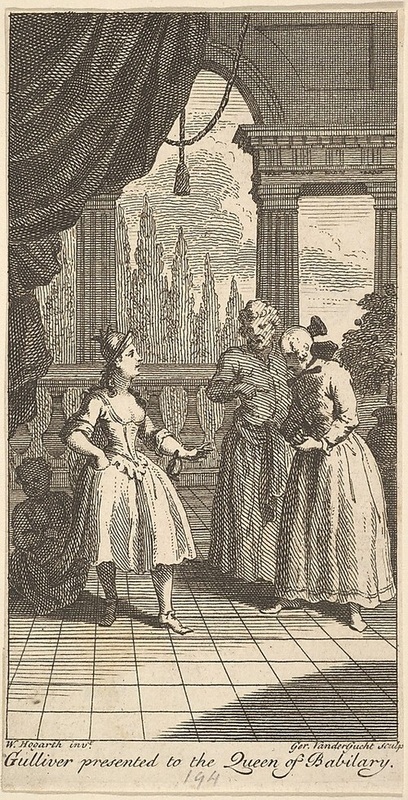 Frontispiece to “The Travels of Mr. John Gulliver,” etching and engraving by Gerard Vandergucht (1696-1776) in 1730. Gulliver is presented to the Queen of Babilary. He is presented to the right of the queen, head bowed, and his hands are clasped together as if in forgiveness for wrongdoing and improper behavior. A man stands next to him, pointing at him in accusation with an angered look upon his face. The Queen seems to be attempting to form her own judgments, but keeps a hand nearby her sword. The shadowy figure behind her, blending into the background, has a malevolent look upon his face, concealed not only by the queen’s dress but also by the shade of the curtains above him. This indicates a manipulative and possibly corrupting force behind her actions.